I bought a charm pack a while ago. 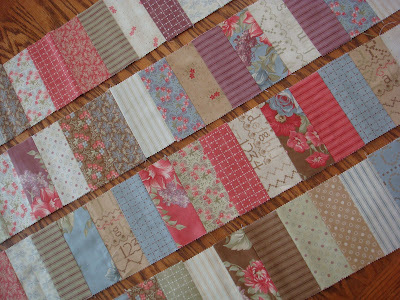 A few weeks ago I pulled it out and thought I'd make a coin quilt with it, using a dark rose or medium blue for the sashing. But I have neither, and the more I look at these strips the more I know they just aren't me and I'll never finish working with them. So please ... take them and create with them! First come, first served on this one ... I'll mail them out as soon as possible. The only catch is that I want to see what you come up with for them! I cannot get the colors right in the photos ... what you see in close to what you'll get, but not quite. So pretty - they would make a lovely quilt. It would be a great Christmas Present for my sister - the colors match her house! 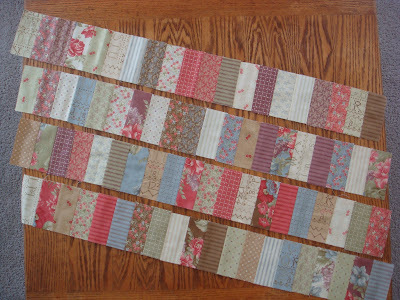 It will be fun to see what someone turns your unwanted fabric into.